Over medium heat, melt the butter in the sauté pan. Add the onions and sauté until softened but not browned, about 7 minutes. Add the salmon parts, the potatoes, bay leaves, salt, and all but a few stalk of the dill. Add enough water to just cover the fish. Bring the water to a steady simmer and cook until fish and potatoes are tender, about 20 minutes. Using a slotted spoon, remove the fish parts from the liquid. When the fish is cool enough to handle, separate the meat and other edible parts (eyeballs, cartilage, etc.) from the skeleton. Add the fish parts back to the soup. Reheat gently at a low simmer, taking care not to break up the fish flesh. Add the cream and the chopped fresh dill. Add more salt, if needed, and freshly ground black pepper. Serve immediately. Leftovers may be kept in the refrigerator for up to three days and reheated over a low simmer. Chicken Broccoli Quinoa Bake 2 cups quinoa (or rice), cooked 2 large chicken breasts 1-2 heads broccoli 1 can cream of chicken (or mushroom) soup 1/2 cup sour cream 1/2 cup mayonnaise pepper squirt of lemon juice 1 stick butter, melted 1 cup bread crumbs 1/4 cup grated cheddar cheese Cook and spread 2 cups cooked quinoa (or rice) evenly across 9x13 baking dish. Cube and pan fry 2 large chicken breasts, set aside. Chop and steam 1-2 heads of broccoli, set aside. Combine broccoli, chicken, 1 can cream of chicken (or mushroom) soup, 1/2 cup of sour cream, 1/2 cup of mayo, pepper, and a squirt of lemon juice in a large bowl and mix. Spread the mixture on top of the rice/quinoa. Melt 1 stick of butter. in another small bowl combine melted butter, 1 cup bread crumbs, & 1/4 cup grated cheddar cheese. Spread bread crumbs/cheese mixture on the top of casserole. Cover and freeze, or bake covered at 350 until heated through. Remove foil for last 10 minutes to crisp bread crumbs. cook the topping: 3 Tbsp oil in pan or wok and heat. Fry meat and then add chopped ginger and onion. Cook briefly and add salt and soy sauce. Add beans, potatoes, eggplant if using, red pepper, cabbage, and tomatoes, stirring a while in between each. When potatoes are almost cooked, add green peppers, garlic, pepper, and black vinegar if using. Add spinach if using, and some water. Bring to a boil. Taste. Remove from heat and cover while preparing noodles. make and cook the noodles: boil water. Stretch the noodles (run through one hand and the other, roll to keep round as you stretch,) for stiff dough, do this twice, for soft, only once. Wrap around hands, one under, one over, until hands are covered and dough is used up. Stretch and slap several times. Boil 2-3 minutes. Lift the noodles from the pot and dip first into a basin of cold water. If you want your noodles hot, redip them in the hot water briefly. To serve: Put noodles in a bowl and then pour topping over the noodles. Make sure there are at least a couple of pieces of meat in each dish. Serve with chopsticks. Left over dough can be frozen, and dough can be made days in advance and frozen. I could already tell that today was gonna be one of those get-to-5-o-clock-with-no-dinner-plan days unless I took the bull by the horns. So I took the easy way out & dumped all these things in the crock pot and plugged it in. Easy. Tasty. No 5 o'clock rush. Win-win-win. Dinner will be ready at the time of my choosing and all I'll have to do is pull out the cheese, tortilla chips, and sour cream. YUM! 2 c water or broth. Set the crock pot on low for 6-8 hours. Serve with crushed tortilla chips, cornbread, sliced avocado, or shredded cheese, & enjoy!!! These two delicious recipes swirl together to form a perfect meal (and perfect leftovers) for cold winter nights. 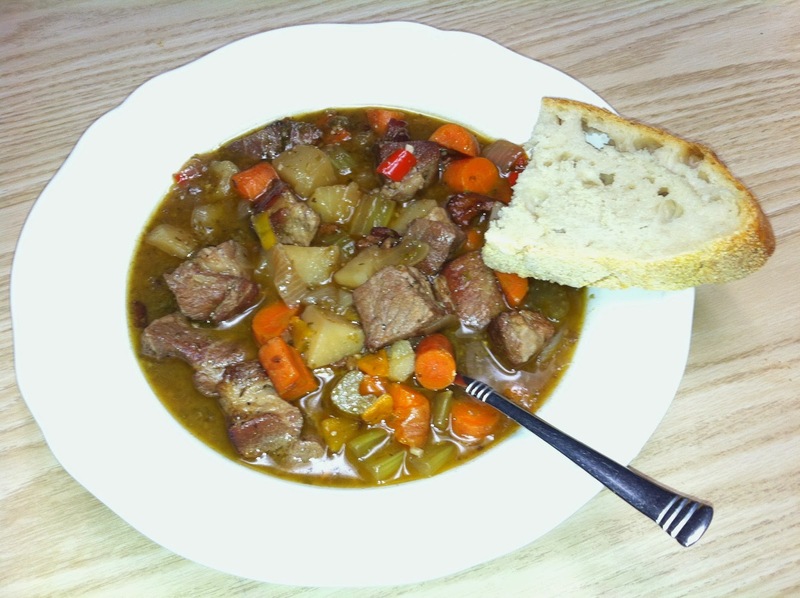 The stew takes longer than the bread, but they are both worth the time they take. 6 cups total of Shallots, Carrots, Potatoes, and red peppers. Spread the pork on paper towels to dry for 10 to 20 minutes before browning. (You can use this time to chop the veggies and dice the chipotle peppers). If the meat is very wet, pat it dry first. In a 6-quart Dutch oven or other heavy-duty pot, cook the bacon in 1 tbsp. of the oil over medium heat, stirring occasionally, until browned but not crisp, (6 to 8 minutes). Using a slotted spoon, transfer to a paper-towel-lined plate and set aside. Do not wipe out the pan! If your bacon was really lean - you might need to add some oil. You want about 3tbsp worth in the bottom of the pan. You'll want it good and hot. Season about one-fourth of the pork with salt and pepper and arrange it in a single layer in the pot (there should be at least 1/2 inch of space between the pieces). 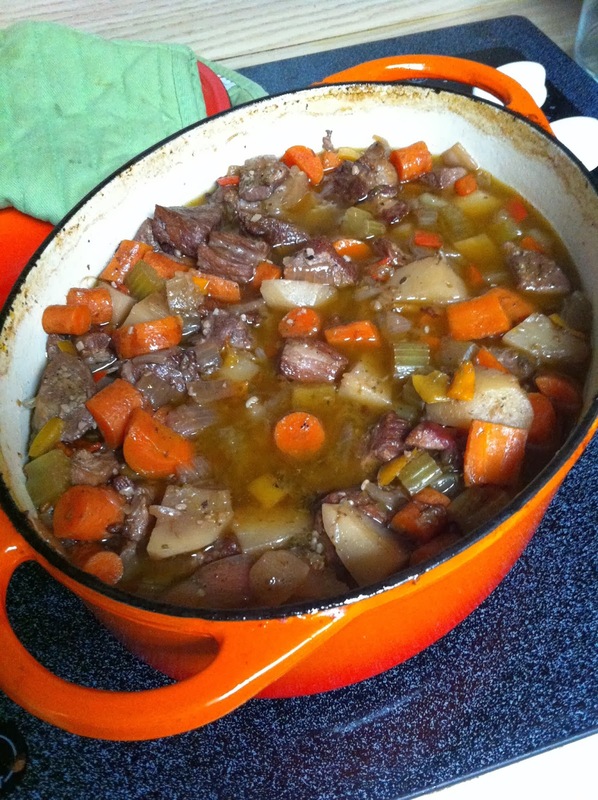 (Personally - I find it takes smaller batches for my dutch oven - but yours might be larger.) Brown well on at least 4 sides, adjusting the heat as necessary; each batch should take about 10 minutes to brown. Transfer the pork to a bowl. Repeat with the rest of the pork, seasoning with salt and pepper before browning. Once all of the pork is browned, remove the pot from the heat to let it cool for a few minutes. Pour all but 2 Tbs. of the fat from the pot. (If there is not enough, add oil to equal 2 Tbs.) Return the pot to medium heat, then add the onion, celery, and (single) carrot. Season with a pinch of salt and pepper, and cook, stirring often and scraping the bottom of the pot with a wooden spatula, until the vegetables begin to soften, 5 to 6 minutes. Stir in the chipotles, garlic, cumin, and oregano and cook, stirring occasionally, until fragrant, 1 to 2 minutes. Return the bacon to the pot. Add the beer, stirring with the wooden spatula to dissolve any browned bits on the bottom of the pot. Raise the heat to medium high and boil to reduce by about half, 5 to 8 minutes. Add the chicken broth and 1-1/2 cups water. Bring to a boil. Crumple a 12x16-inch piece of parchment paper, then flatten it out. (Crumpling makes it easier to manage.) Place the parchment directly on the surface of the stew, allowing the ends to come up the sides of the pot. Cover and put in the oven for 30 minutes. During this time, chop the carrots, potatoes and shallot. The carrots and potatoes should be in decent sized chunks. The shallots can be added whole if they're small or quartered if large. If you have more time, this is a good time to roast the red peppers. (Unless you just bought them roasted.) Just use an open flame (grill, gas stove, whatever) to char every inch of the surface. When this is done, put the peppers into a bowl and cover it tightly with plastic wrap. The longer it can sit like this and steam the better. After the 30 minutes are up, add the carrots, potatoes, and shallots to the pot. Cover with the parchment paper and lid, and return it to the oven for another 30 minutes. Towards the end of this time, take the peppers out of the bowl and with a pair of tongs (if they're still hot) and a knife scrape off the skin. It should come off fairly easily. Then slit the pepper from stem to base and cut around the stem - the stem and the seeds should come out easily. Cut the rest of the way through, and wipe away any seeds and cut out what membrane you can. Then chop. When that second 30 mins is up, add the peppers. Cover with the parchment paper and lid, return the pot to the oven, and cook until the pork is fork-tender, about an hour more. Stir in the cilantro. I also like to, degrease the stew by laying a clean paper towel over the surface of the stew and gently pushing it into all the bumps and dips, then quickly peeling it off - repeating as needed till you don't see the sheen of oil on the surface. Season to taste with salt and pepper. Now -- I find that the stew is always better the next day. So I like to let it cool to room temperature, put it in the fridge, and then warm it up in the oven again the next day (usually ~300 degrees until hot). Or at least - that's the idea. I've not yet done it a day ahead as everyone wants to eat it. I did manage to make it in time for lunch and let it sit at room temp all day and then heat it for dinner though -- definitely worth it. The bread is actually really easy to make. Preheat the oven to 450. Make sure you do this first! Once you finish mixing the dough you need to get it in the oven quickly, you can't let it sin while it preheats. Lightly flour a baking pan now too. Sift together a pound of flour (3 & 1/3 c. sifted-- not packed-- flour), 3/4 tsp baking soda, 1/2 tsp salt in a largish bowl. Make a well in the center, and pour in about 1 1/2 cups of buttermilk. Using your hands mix it together. Spread your fingers out like a rake and mix it in a circle around the bowl. You want a light touch here, and don't overdo it. The baking soda interacts with the buttermilk to create air pockets in the dough and you don't want to break them. Just mix until it starts coming together well. You might need to add more buttermilk - just do it ~ a tbsp at a time or you risk getting it too moist. Scrape the dough out onto a well floured surface and shape it into a round. A little over six inches across and about an inch and a half high in the center (no higher!). Then flip it over onto the pan so the floured side is up and make a shallow X cut from side to side about 1/4" deep. This cut isn't just in the top, it stems all the way from edge to edge. Put it in the oven for about 15 mins, then lower the temperature to 400 and bake until it's brown and sounds hollow when you tap the bottom (20-30 mins). I prefer to rotate the bread when I drop the temp as well - it promotes more even baking/browning. Pretty sure this is the easiest bread recipe I know, and it's definitely the quickest. 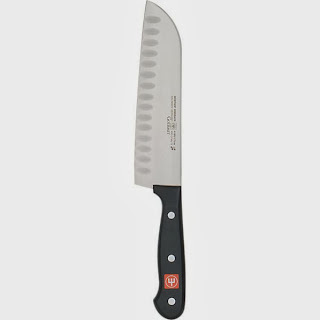 It's a 7-inch hollow-edge Santoku knife. Santoku is just a fancy word for Chef's knife that has a brilliant edge but lays flat to the board (rather than curving). It has become my go-to knife for pretty much everything. 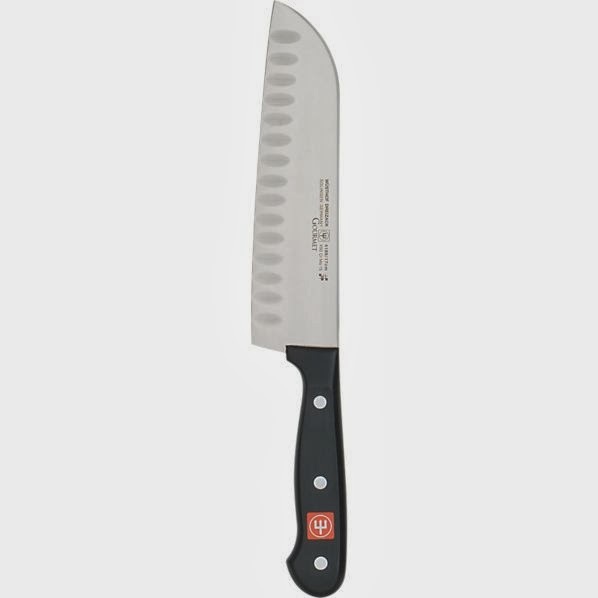 Sturdy enough to cut through something hard like acorn squash, but light enough to slice onions, thin-slice potatoes, chop garlic… it holds up to whatever you put it through, and keeps chopping beautifully. I love the weight and feel of this Wusthof. It's a touch pricey, but for a gal like me who's in the kitchen multiple times a day cooking for a hungry crew, the cost per use is pennies, even in just one year's time. I got mine over two years ago and it's still going strong, and is absolutely my favorite knife in the world. I highly recommend it!